E’s Complaint by Steven Clark, edited by Clare Diston (Human Voices Editorial Services). E’s Complaint is a deeply moving novel about depression, alcohol abuse and suicide. It is Steven Clark’s first novel and he has self-published it on Kindle. The book follows a nameless narrator who finds himself spiralling deeper and deeper into despair following the death of his grandfather. He is accompanied by the voice inside his head, Eric, who has a brutally honest and often darkly humorous outlook on things. The narrator must deal with a troubling relationship with his father, repeated female rejection, and an endless plague of thoughts that maybe none of this is worth it after all. Clark’s writing captures both the ugliness and the beauty of life – he switches between descriptions of soaring, agonising emotions and grotesque physical banalities with breathtaking deftness, in language that often borders on the poetic. 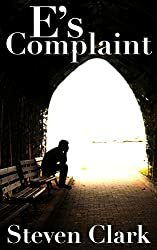 If you love dark themes and accomplished writing, E’s Complaint is for you.